Inside a kitchen remodel that did a complete 180°. One look at her brand new kitchen and it’s easy to see why the space is getting widespread acclaim. The architectural transformation alone merits an award. Not satisfied with the old kitchen, which Lachapelle says was like a “tiny little closet,” she and her husband set out to completely reconfigure the layout of what was previously a seating area, bathroom, and closet. While creating a functional space that would meet the family’s needs was the top priority, Lachapelle also wanted to preserve some of the home’s historical charms. To accommodate a winding staircase, she designed the kitchen in an L-shape. The space also had gorgeous 13-foot tall ceilings, so she opted for floating shelves in lieu of traditional upper cabinets. It turns out that her “nod to nautical” (the of-the-moment navy and brass color scheme) was a bit ahead of its time. While navy is one of the top kitchen trends du jour, Lachapelle says this wasn’t always the case. 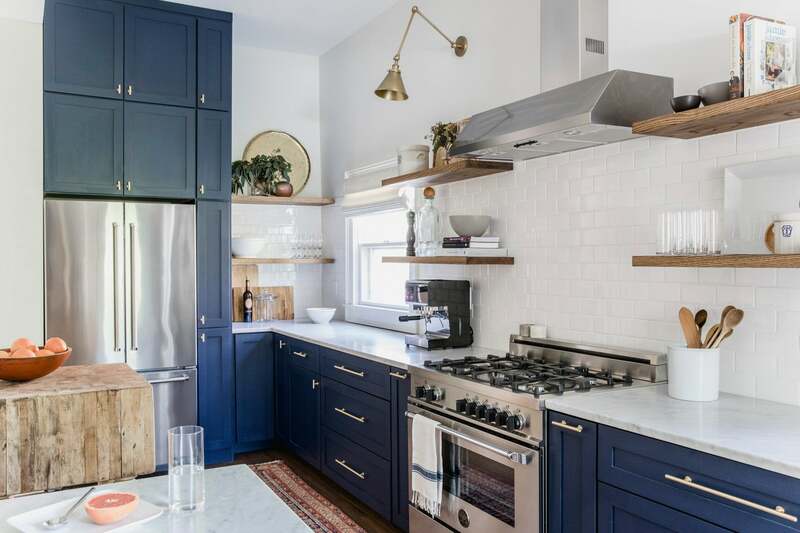 “When I was looking at kitchen designs back in 2015, navy was the new up-and-coming color. I’m usually a white kitchens person but I wanted to try something drastically different, and funnily enough over the course of the year that trend—specifically with brass—really took off. At the time, matte brass was impossible to find,” she says. The family’s nearby living room also got some major TLC. A previously dated space (“just straight-up 1982” says Lachapelle) was turned into a light-filled joint living/dining room that makes the perfect space for entertaining. Lachapelle kept some of the room’s more charming characteristics like the fireplace and 2-foot historic crown molding, but other parts of the space needed more drastic change. Since there was initially a studio apartment directly above the living room, the couple had to take down the ceiling and reconfigure it to get the full advantage of the home’s tall ceilings. They also refinished the floors (which were the original ones from 1875) and painted everything to breathe new life into the space. Despite the bigger changes, Lachapelle says that her favorite pieces from the redesigns are a little more personal. The works of art, which hang in every room of the house, are all done by her husband. “I love that my husband’s artwork is all around the home, which highlights his work in a really beautiful way, and I like living with his paintings,” says Lachapelle. Given the couple’s artistic background—Lachapelle also has a studio art degree and is currently a merchandiser and visual manager at Anthropologie—the large-scale renovation seems less daunting. The kitchen, which was the couple’s latest project, was just one in a series of renovations the home has undergone in the past year. For those interested in attempting a similarly invasive renovation, Lachapelle recommends going straight to an architect. “If we’re taking down walls, we always talk to an architect or a contractor who knows structure and knows how to help you put in a support beam if you need it—that’s the number one most important thing,” she advises. Besides knowing when to ask for help, Lachapelle also stresses the importance of flexibility and managing expectations for any big home makeover project. Keep up with Heidi’s latest projects on www.heidilachapelle.com.